My name is Allison. I’m in my twenties, and I live in Oklahoma. I hope that someday I will actually finish getting my Masters Degree in Library Science. Reading is kind of a big deal to me. 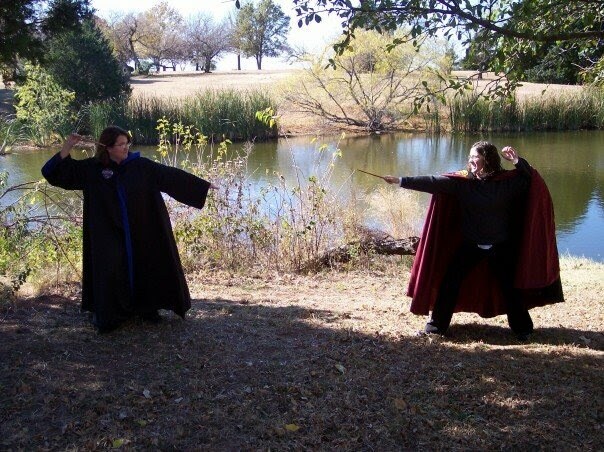 So are really nerdy things like mock duels in wizarding robes. Although I’ve been a reader as long as I can remember, Harry Potter basically owned me as I was growing up. Nothing will ever replace those books on the top of my favorites list. Other favorites of mine include Anne of Green Gables by L.M. Montgomery, Name of the Wind by Patrick Rothfuss, North & South by Elizabeth Gaskell, The Sky is Everywhere by Jandy Nelson, Persuasion by Jane Austen…the list goes on and on. I have a loved it shelf on Goodreads with all my highest recommendations. I really will read any book that sits still long enough. My favorite genres are fantasy, historical fiction, romance, and all types of young adult…but I am willing to try anything at least once. Anyway, I hope you enjoy my blog! If you have any questions you can email me at allison.dayle@gmail.com. My review policy can be found here.